Fans have waited with baited breath as Venus d Minor prepared ts first album in a decade–now about to launch into the Universe. 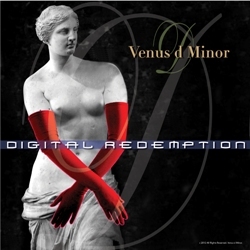 Digital Redemption brings fans the classic Venus close-harmony sound, with new arrangements of pop songs like “Last Train to Clarksville” and “Perfect Day” as well as old standards like “Accentuate the Positive” and “Miss Otis Regrets.” Plus funny lyrics by long-time Venus member Robin Sloan, re-applied to old standards like Cole Porter’s “It’s Alright With Me”–now transformed to “It’s Too Tight for Me” about a woman, a pair of pantyhose, and a date. Hear Venus’ unique brand of harmony and humor at the upcoming CD Release Concert at the Garrett Park Town Hall, June 23rd. See our Events Page for details –tickets are selling fast!